So, this is how (un)excited I was after seeing Skyfall. No spoilers, but I have to admit I was pretty disapointed. A tux would've probably been more appropriate for the premiere, but it was a cold and snowy night so I went for warm and heavy stuff. 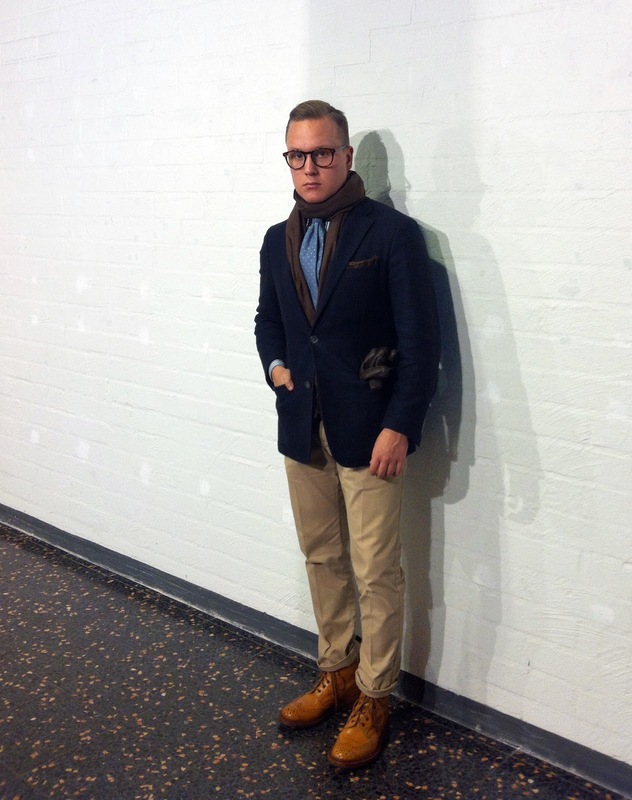 Navy jacket, striped bd-shirt with long collar points, casual beige chinos, blue with white pindots tie, brown wool scarf and brown leather gloves. Made some good orders this week, so next week will include some nice picsof beautiful things. Furthermore, good stuff coming still this weekend, so stay tuned and like on FB. Are the glasses Persols? I like how you tied the scarf, haven't seen that in a while, I'm gonna try it too. About Skyfall I've heared mixed opinions but I am still going next week. I guess Bond has to adjust to the times, to make big bucks. If you give a modern fast food eating, drinking 'till he falls teenager who is used with The Avengers, Transformers and stuff like that to see classics like "From Russia with love" or even the more recent Brosnan interpretations you would bore him to death. But then again I quite enjoyed the other two Daniel Craig movies. Yeah, and I think it did evolve into a good direction. Casino Royale was one of the best if not the best action movie/thriller of the last decade in my opinion. QoS was horrible, and this one was.. Well, like I said, no spoilers from me, but it wasn't the film I wanted to see. this has got to be my favorite outfit of yours in a while. love how the tricker's give the whole look kind of an edge. also, i agree on "skyfall" being not as good as "casino royale". Thanks sma. I like them here as well, but thinking about it now I would change the trousers to another color, perhaps olive, if I had a pair of the right kind. personally, i am a big fan of the khaki and navy color combination, so i think it looks great here aswell! i also like how the shades of brown of the shoes and the trousers go together.